Hello sixth grade students and families! Welcome to the sixth grade Grammar page. Here you will find general information about our Grammar curriculum. First of all, Grammar is a trimester class, so students will only have it one trimester each year at Seven Hills. 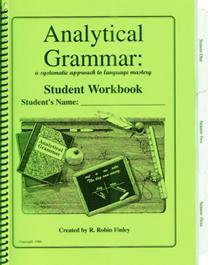 Our students work out of the "Analytical Grammar" book. The Analytical Grammar curriculum is split into three seasons. In sixth grade, we start by covering Season 1, which includes basic parts of speech (nouns, pronouns, articles, adjectives, etc. ), the jobs that words can do in a sentence, and basic diagramming skills. In seventh grade, the students will cover Season 2, which includes four different phrases and three different clauses that students will encounter in more complex sentences. Eighth grade Grammar covers Season 3, which focuses on using the knowledge of parts of speech, jobs, phrases, and clauses to incorporate punctuation correctly in sentences. Visit the "Curriculum" tab to find information and links to review exercises for each of the Season 1 units. Visit the "Files & Materials" tab to find digital copies of the handouts passed out in class as well as helpful worksheets like a "Parent Cheat Sheet" with a summarized overview of Season 1. Below, you will find games and practice quizzes for each of the units covered this year.